We pledge to honor your patronage and trust with service, clinical insight, and an unwavering commitment to your health that goes beyond your highest expectations. Watch the Conde Center video. Chiropractic neurology is based upon the understanding that the nervous and musculoskeletal systems are intimately related. The Conde Center integrates traditional chiropractic care with highly advanced neurological rehabilitation procedures to create custom treatment solutions for each patient that seamlessly transitions them from pain to wellness. 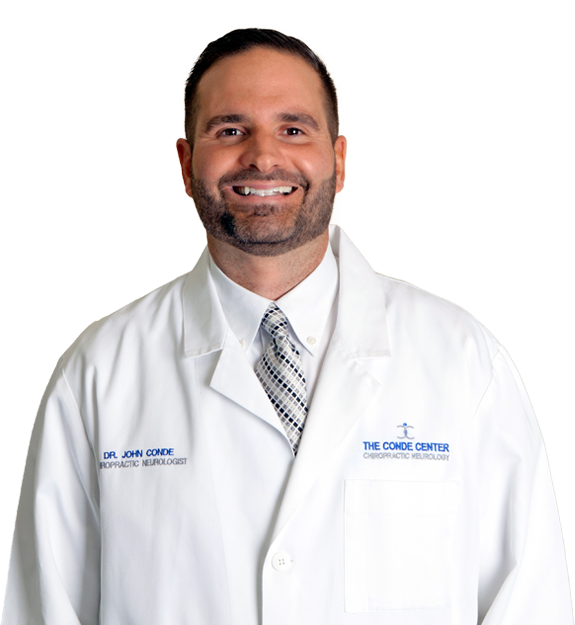 Dr. John Conde is a native Floridian, born in Miami and raised in Delray Beach. He is a Board Certified Chiropractic Neurologist and a Diplomate of the American Chiropractic Neurology Board. He established the Conde Center for Chiropractic Neurology in 2006. His vision was that of delivering the most advanced, evidenced-based treatments in an environment with state-of-the-art equipment and expertly qualified physicians. The goal was to have a clinic where orthopedic conditions like herniated discs, stenosis, arthritis, shoulder-knee-hip injuries would respond definitively to the curative treatments provided. In addition, Dr. Conde’s passion for the neurological sciences and the treatment void that is present in medical neurology for patients with neurological dysfunction sparked an endless drive to become an expert in functional neurology. Chiropractic Neurologists are experts of brain function and are considered clinical neuroscientists. This depth and breadth of knowledge allows for laser sharp diagnostics and improved outcomes for patients with neurological complaints. Functional medicine is a relatively new, cutting-edge term that describes a continuum of health in which the traditional definitive line between health and disease has been stretched to include most of the population which is neither completely healthy nor diseased. Safe, painless, and effective relief from neck and back pain. Gold standard for conservative treatment of disc herniations and spinal stenosis. The use of specific wavelengths of light to improve healing time, eliminate pain, increase circulation, and reduce swelling. WBVT stimulates sensors found in the musculoskeletal system called muscle spindles that increase muscle tone in the spine and the extremities at a much faster rate than traditional exercise and enhances the brain-body connection. Thus time-to-strengthen is significantly reduced. Unites traditional chiropractic medicine with advanced neurological rehabilitation procedures. Chiropractic neurologists provide laser sharp diagnostics and improved outcomes for patients with both orthopedic and neurological complaints. Improve memory, coordination, balance, cognition and more. The future of neuro-diagnostics and brain-based rehabilitation. The pinnacle in assessment and treatment of dynamic posture or balance. CAPS professional is the most accurate and expeditious instrument available producing results within 60 seconds allowing the clinician to retest routinely and measure treatment efficacy. Revolutionary diagnostic and rehabilitative tool assessing essential neurological faculties such as cognitive processing speeds, visuo-motor-spatial awareness, and short term memory. Gold standard in traumatic brain injury management.